Beginning in October 2018, Project Angel Heart clients will see a big change in the amount of food that volunteers deliver to their homes each week. The number of medically tailored meals in meal bags will increase from five to seven, and the amount of food in breakfast bags will increase by approximately 40 percent, as well. The changes come as a result of recent research, including our own study, showing significant health benefits associated with providing medically tailored meals for people living with chronic disease. Currently, clients receive five medically tailored entrees, fruit, milk, bread, and sides each week. Those who are severely underweight or malnourished also receive five breakfast meals. That all adds up to an estimated 24 to 48 percent of the calories people would typically consume in a week. Starting in October, clients will receive seven to 14 meals each week, accounting for 33 to 67 percent of their weekly nutrition. 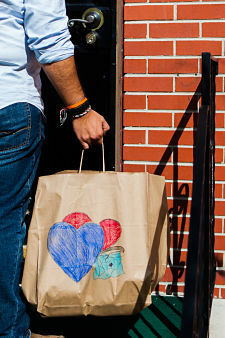 In October, Project Angel Heart clients will begin receiving 40% more food- which means an increase from five to seven weekly meal trays, along with additional items for those who receive breakfast. The change will result in significant increases to Project Angel Heart’s operating budget, as well as additional opportunities for volunteers. Increased food production has created a need for additional kitchen volunteers in Denver, and additional meal delivery drivers will be needed in both Denver and Colorado Springs. If you are interested in joining our volunteer team or know someone else looking for a fun and rewarding volunteer opportunity, please sign up for an orientation here. This entry was posted in News by Hannah Koschnitzke. Bookmark the permalink.